My Name is Tom and I am the survivor of an ABI. I have covered all the basic medical, science type stuff that will hopefully provide you some with knowledge as to why I suffered from the after effects that I did. You will hopefully notice a change in the tone of my writing as I am no longer repeating facts I have found out from a book, my medical notes or the www, I am speaking from the heart. What I aim to do now is get on with telling you my story and about my experiences, in other words the more useful stuff. Anyway, where were we? Right, I had come out of surgery; I was hanging on to life by my fingernails and had been placed in an induced coma to allow my brain time to rest following the injury. A section of my skull had been removed to reduce my high level of ICP and was being carefully stored beneath the skin of my stomach to ensure it had the blood supply it required to stay alive. My family was in bits (just as much as my skull was) and nobody knew what was going to happen next. I had been in the coma for only a few days with my ICP dropping steadily over that period until it stabilized. Doctor’s were astounded at how quickly this was happening. A patient coming in to the hospital with the injuries I had suffered, with a Glasgow Coma Scale score of 3 and recovering at this speed was unprecedented. Such was the rapidity of my recovery that they attempted to bring me out of the coma on the fifth day. However, a severe case of projectile vomiting during this attempt discouraged them. The risk of me choking on the vomit was too great, apparently (not because they were afraid of getting covered in sick). So I was sedated and sent back to my local hospital in Dorset within a few days. Here, the attempts to bring me round would continue. My mother says how much of a struggle the whole thing was. I did not know what was happening or where I was. I was confused and distressed at the situation. I would thrash around as they tried to wake me up, I was pulling out tubes and pipes, and lashing out (I even pulled out my catheter the second time they tried to bring me round. For anyone that doesn’t know, a catheter is the pipe that goes up your urethra so you can pee!). It was about ten days after I had been put in the coma that I finally was brought out of it. I was awake! I was Awake but I was certainly not myself. I’ve been told I could recognize people and occasionally acknowledge their presence, but I was aware of little to nothing that was going on around me. The truth was that I was suffering from Post-traumatic Amnesia. PTA is a state of disorientation and confusion that occurs after a massive head trauma that causes a patient to forget events that have happened after the injury. If I were to say anything to the families of people with PTA, it is that it will pass. From our experience as a family, we found that the presence of people that the patient knows and recognised was helpful, as was the presence of memory cues posted on the walls of my room (telling me basic information such as where I was, time of day, days of the week etc.). Honestly, from our experience, the sound of a parent’s voice and their presence was invaluable. It may not be medical fact that we are working from, but it can only do a patient good to hear a voice of comfort when they are in such a distressing situation, surely? It’s difficult to put into words,I think this part is somewhere between human instinct, in the way the patient recognises the voice of a parent, a partner, or sibling, and empathising with the patient. Wouldn’t you want people there for you, in that situation, talking to you and telling you it would be ok? The reality is, with PTA, that after a head injury, the short-term memory in the brain is not being processed into long-term memory. Think of it this way, if I may give a simple example. You have your lunch, say a cheese sandwich, normally this will go into the short term memory before being processed and placed in the appropriate drawer of the filing cabinet to be retrieved and looked at a few hours later. In the case of PTA, the piece of information is not being transferred from the short -term memory to the long-term memory; hence it cannot be retrieved and looked at later on. To help with this process my parents had pictures, written memory cues and so on, posted all over my room. During this stage, the only advice I can really give anyone is to be there as much as possible, to talk to the patient and give gentle reminders while being patient. It’s perhaps better also if the carer or family can perform the memory tests on the patient (which is essentially the patient being presented with sheets of pictures or to countdown from twenty backwards). The reason I say this, is that a carer or family member who is around the patient for long periods of time is more likely to spot periods of time where doing the test is best for the patient (when they aren’t tired, when they haven’t just woken up etc.) as opposed to when it is better for the doctors/nurses. What we found, essentially, is that the presence of family or carers is so important! In the last post, I covered the injuries to the brain that I suffered (as I understand them in layman’s terms). In this post, I will be looking at the different sections of the brain, what they do (again, as I understand it), and that will lead us on to the next few weeks where I will discuss the problems I had when waking from my induced coma. Trust me, I am doing my best to get away from the medical stuff, the neurology, and move quickly on to my experiences and the real meat of this blog. From the research I did through my medical notes, it seems that most of the damage was done to the temporal lobe, the occipital lobe, and some minor damage to the frontal lobes (and I’m sure other places suffered some minor damage due to the midline shift/increased ICP). Now, finding out the function of the different parts (or lobes) of the brain has been interesting to me as it has allowed me to put the after effects I still suffer from in some kind of context. I had done little to no research prior to this blog on what effect the damage to different parts of my brain has had on me. It is much easier to not address it: to live in denial of something is a lot easier than accepting it and taking steps to address and overcome it. After all, it is only really in the last year to eighteen months where I have started to truly accept my ABI and what it has done to me. Now, the different lobes of the brain and what they do. This is how I understand it and the picture below should give some clarity on the locations of the different lobes. 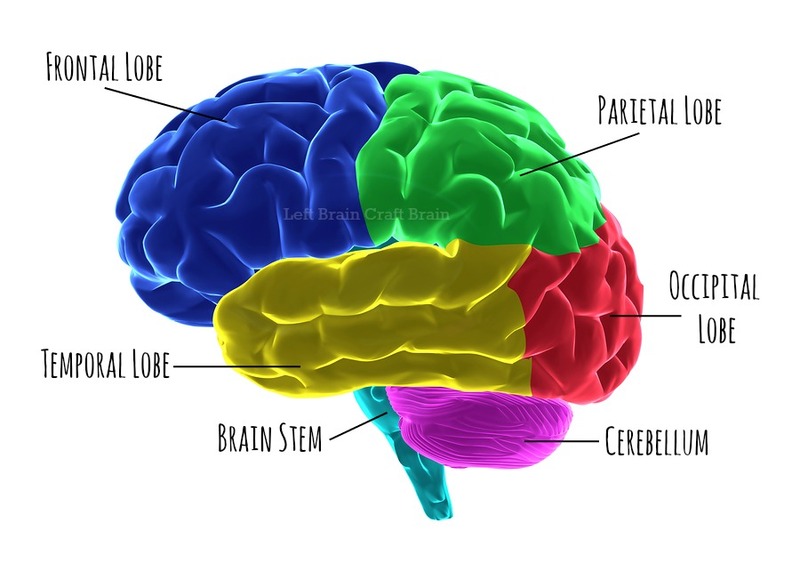 Colour coded and labelled picture indicating the different lobes of the human brain. The main section of the brain is called the cerebrum and provides the tools for thinking that we use in every day life. It is divided into right and left hemispheres: The left hemisphere is responsible for the logical side of thinking, numbers, words, lists, logic, sequence, linearity etc. and controls the right side of your body. Whereas the right hemisphere controls the left side of your body and is responsible for the more creative endeavors such as rhythm, spatial awareness, colour, imagination and daydreaming. The cerebrum is then split into four different lobes, each of which has a different function. The Frontal Lobe – The frontal lobe controls so many different aspects of what we do and what our brain does. To include just a few, it controls creative thought, problem solving, intellect, judgement, behaviour, attention, physical reactions, muscle movements, smell and personality. The Parietal Lobe – The Parietal Lobe mainly focuses on comprehension, monitoring things such as language, reading, visual functions, internal stimuli and sensory comprehension. It is also home to the Sensory Cortex and the Motor Cortex. The Sensory Cortex receives information from the spinal cord regarding the position of our many body parts and how we are moving those body parts. The Motor Cortex helps to check and control the movement of the body. The Temporal Lobe – The Temporal Lobe controls our visual and audio memories. Located here are sections that help us with speech and language as well as hearing. It also has an effect on some of our behavioural factors. The Temporal Lobe also houses Wernicke’s Area. Little is known about this area by even the best doctors but it is known to help us formulate/understand speech. The Occipital Lobe – located at the back of the head, it helps to control vision. The Occipital Lobe also houses Broca’s Area, the area of the brain that controls the facial neurons as well as our understanding of speech and language. So theses are the four main lobes of the brain. I promise you, that that should be that on the science jargon. But I felt it to be important to include some of the scientific/neurology stuff as it places my future experiences in a proper context. So I hope to see you here again. Would love it if I could get a few more followers on Twitter (follow me @ABIblogger) and maybe follow my blog while you’re here. I assure you I am doing this with the main aim of helping people. Any feedback I can get would be amazing! Thank you so much everyone. Stay strong!